I'm SO in the holiday spirit right now. Flurries are swirling in the air outside the window and I'm about to travel around the midwest to do the tour de family, which I couldn't be more excited about. Yep, I'm ready for the people and pies I love to be gathered around the same table as we come together and give thanks. Since tomorrow kicks off a whole special season of giving and tradition, and because I'm ready to get my apartment lookin' its holiday best, I thought I'd share a print that's available in the shop. If you are on the hunt for some festive decor, be sure to head to my Etsy shop and browse around! Christmas cards, custom stamps and some fun gift ideas are also there, too, so keep your eyes open for those! Hope you had a fabulous St. Patrick's Day weekend! We channeled our inner-Irish with reubens for dinner and they were SO GOOD! I love this little Irish blessing and am posting it in honor of my grandpa, the greatest Irish man I ever knew! It's coming, it's coming! Valentine's Day is just around the corner and it's time to get down to business. I'm not talking about making dinner reservations or picking up some chocolate or making sure you know where to find some roses...although I have nothing against any of those arrangements. I'm talking about professing your love to the people around you. Here's the challenge: Make Valentine's Day extra special this year. Send a note to your aunt. Leave your roommate some love. Mail some sunshine to a long distance friend letting them know they are the best. You can express yourself however you want. Write it on a Post-it note. Draw something on a napkin. Frost a message on a cake. Paint a sign and put it on the refrigerator. Let's be thankful for the special people in our lives and tell them how much they are cared for this year! Want to share your Valentine plan? I'd love to hear below! xoxo, Your secret admirer P.S. If you'd like to send a card to someone, I know of a shop that has some pretty cute ones!!! 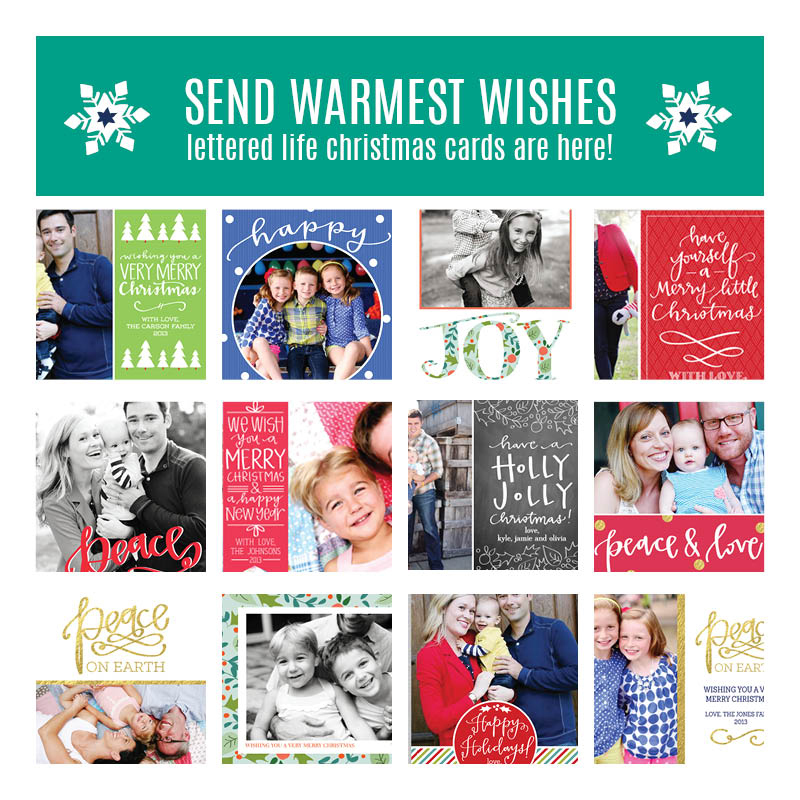 Head on over to Lettered Life Shop for some options, including the cards featured above! Today I just wanted to share a little project I recently completed for my soon-to-be niece! She's due any day now, and we are SO EXCITED to meet this little one. She will be my very first niece (or nephew, for that matter), and I can't wait to have her in the family! We had a shower for my sister in law last weekend, and I knew I wanted to make a something special and personal for this get together. I'm a HUGE fan of reading, and I knew I wanted to give the baby some sort of personalized book that she could look at/read as she gets older. I decided on an alphabet book where each page would have a letter of the alphabet and a family-related photo. And since writing poems is in the blood (hiya Carmody Clan! ), it's definitely a rhyming book! I used a Cricut (a fancy schmancy machine that cuts paper into specific fonts or shapes) to cut out all the letters, found the cutest little girl paper I could find and gathered pictures from my albums and from my sister-in-law's. All the completed pages were then slid into the plastic sleeves of an 8x8 scrapbook. I figured this might protect the pages from little people hands! It was a labor of love that I had so much fun making. There were approximately 800 scraps of paper floating around the apartment by the time I was done, but I was so excited with the final product. It was everything I could do not to tell my sister-in-law what I made, but I thankfully kept it a secret until the shower. She opened it that day and shed a little tear...mission accomplished!